Builders in Orange County are using an innovative approach to solve the long-running problem of homelessness among veterans. They're transforming old shipping containers into new permanent homes. The 16-unit apartment complex uses 54 recycled shipping containers that have been redesigned so each apartment has a kitchen, bathroom and living space. When finished, the project, called Potter's Lane, will have two stories with a balcony, stairs and a courtyard. And each 480-square-foot apartment will house a veteran who is coming off the streets. 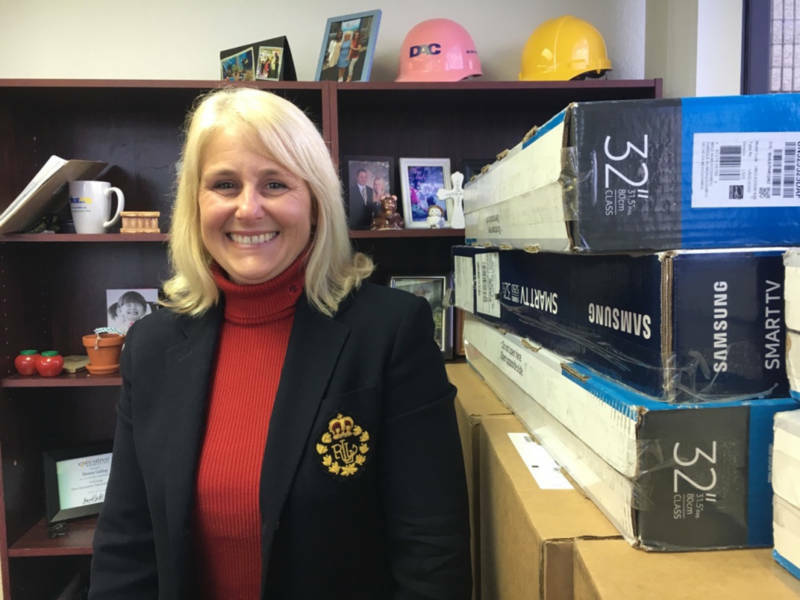 "We got the design ready, we hired our architect, and as we went through the process found out that this was going to be the first multifamily project in the nation that was going to be built with recycled shipping containers for homeless," said Donna Gallup, the president of American Family Housing, the nonprofit overseeing the project. "We designed the project specifically to meet the needs of homeless veterans," Gallup said. That means a U-shaped design that seeks to balance privacy with collective living. "We're hoping that it will build community, reduce isolation and help them feel like they're a part of something bigger," said Gallup. "Hopefully, it will lead to some very successful long-term permanent housing." The timing of the project, from design to finish, came in at about a year, and the speed is one of the reasons builders chose recycled shipping containers. 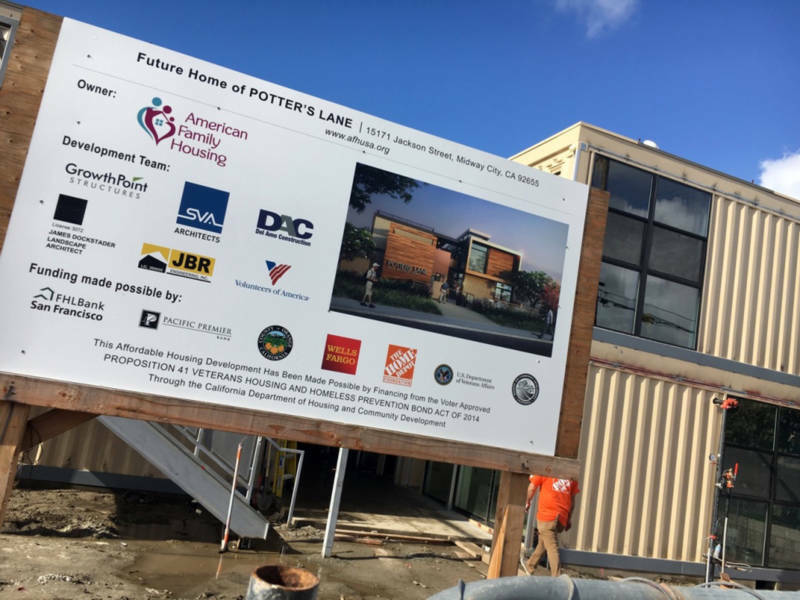 Last year, the nonprofit won a $1.8 million housing loan from the State of California Department of Housing and Community Development and the California Department of Veterans Affairs to start the project. 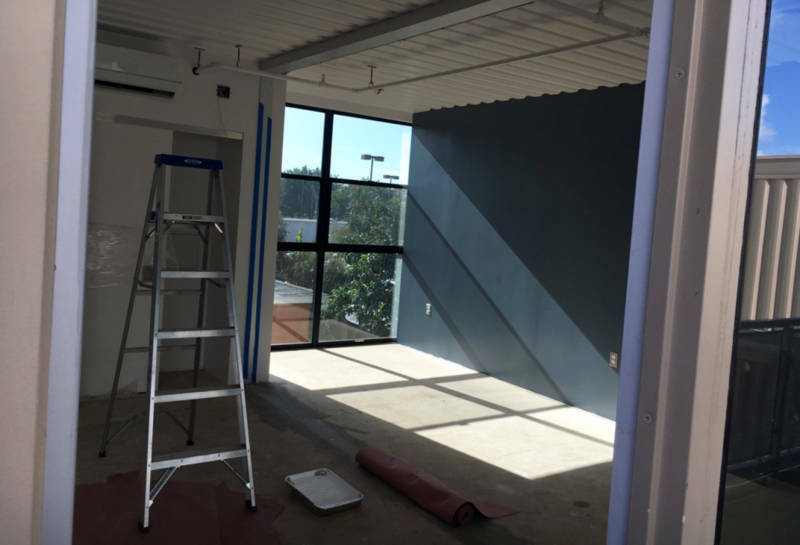 The shipping containers went to a manufacturer to be redesigned in May and were ready to install on the building site by September. Gallup said the containers are energy-efficient, with strong steel sides that won't need a lot of upkeep and long windows on the sides to let in sunlight. "It's especially important now because of the tremendous demand for zero-bedroom and one-bedroom units in the area and the shortage that we're experiencing currently," said John Hambuch, housing assistance manager for the Orange County Housing Authority, a partner in the project. His office receives 19-25 referrals a month from the U.S. Department of Veterans Affairs, about 70 percent of whom are looking for single-bedroom apartments or studios. Veterans who are eligible can receive housing vouchers to help pay for the rent, but the tight private market makes it hard to place many of them, said Marie Vu, who works with the Veterans Affairs Supportive Housing, or VASH program, in Orange County. There's also a four-month window of eligibility, so without an extension, the tight timeline makes finding a rental space in the private market tough. The Potter's Lane project aims to close this gap. Counselors from the VA and American Family Housing will have offices on-site so they can keep track of how veterans are adjusting and troubleshoot any problems that come up. "We don't want to just get them into a unit and then say goodbye," said Hambuch. "We want to be able to ensure that they'll be there successfully." The veterans homeless population in Southern California has decreased in recent years. In Los Angeles County, the number of homeless veterans dropped by 30 percent last year from 2015, according to the Los Angeles Homeless Services Authority. But the problem has persisted. Los Angeles Mayor Eric Garcetti had to back away from a pledge to end veterans homelessness by 2015, after the year concluded with veterans still on the streets. He's since called the issue his "highest priority," though he's refrained from putting a new date on the goal. In January, during a visit to Los Angeles, then-VA Secretary Robert McDonald called Los Angeles his "greatest challenge" in ending veterans homelessness. "The scale here is just so large," said McDonald. "There's not a lot of low-cost living here, so we need creative solutions." Most recent estimates put the homeless veteran population in L.A. and Orange Counties at about 3,500, though officials like Hambuch at Orange County Housing Authority caution that the counts could be low. One of the veterans getting ready to move in to Potter's Lane is Jimmy Palmiter, a 59-year-old Army veteran. He heard of the project from a VA counselor, but was wary at first. "I had my misgivings; I wasn't quite sure until I saw the place," said Palmiter, who was unfamiliar with the area. 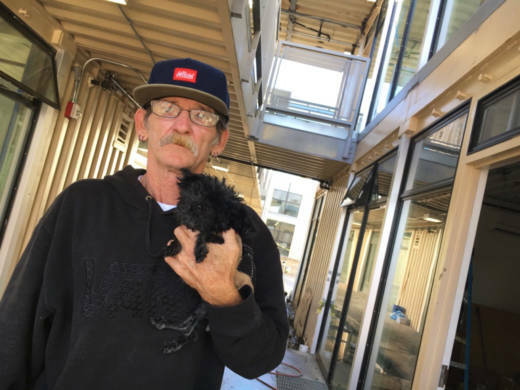 Palmiter said he's been homeless for about 4½ years, living mostly in cars, with his dog, Fifi. On a recent visit to the site, he held Fifi in his arms as he stood outside an unfinished apartment. Plastic sheeting still covered the kitchen countertops and electrical wires hung from the ceiling as two workers prepped the walls for a new coat of paint. But the home was coming together. "This is just gorgeous, and one of these apartments is mine," said Palmiter. As he spoke, he leaned on a cane, still recovering from a fall three years ago that shattered his right hip and ended his sporadic construction work. "Now I'm just trying to live a life with as little pain as possible," he said. He's scheduled to move in by Feb. 8, just three days before his birthday. "I'll be 60 years old next month and it's time for me to get off the street," he said, gazing at the shipping container-turned-apartment. "I can't wait, I can't wait." This story was produced by the American Homefront Project -- a collaboration of KPCC, WUNC and WUSF -- with funding from the Corporation for Public Broadcasting and the Bob Woodruff Foundation.